I've been playing around with different ways for kids to tell digital stories. One thing I love about the iPad is that kids can use multiple apps to create content. App + App = even more ways for students to become engaged in creating and expressing themselves. Today I'd like to tell you about how kids can use an iPad and a couple of different apps to tell a story and create a little comic. I'll share my own creative process in the hope it may help. The apps I used: ToonPAINT-HD and StripDesigner. I've talked about Strip Designer before. It's a really useful and very versatile app for an educational setting, or for parents who want to encourage kids to create their own content. ToonPAINT-HD is an image editor. It converts photos to sketches and then allows us to hand-colour them, giving a really nice comic-style look to digital stories. What I did: I found some photos in my camera roll that I thought I could weave a short narrative around. Because I had to reduce the file size so The Book Chook viewers wouldn't be disadvantaged, the font may be too small to read. Here are the captions for How Rumours Spread: 1. I know it must be round here somewhere. 2. Hey guys, have you seen my marble bag? 3. Psst, pass it on, he's lost his marbles. 4. Har Har Har! hear that? He's lost his marbles! The first pelican seemed to be searching for something and my what if came up with "a toy of some sort". Once I skimmed through more photos, I developed the idea of the bird community being a lot like human communities, with rumours flying thick and fast. 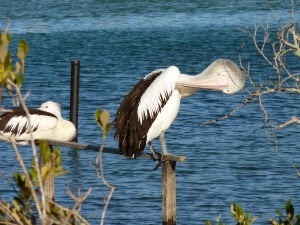 The play on words with marbles just popped up when the last pelican seemed to be laughing scornfully. 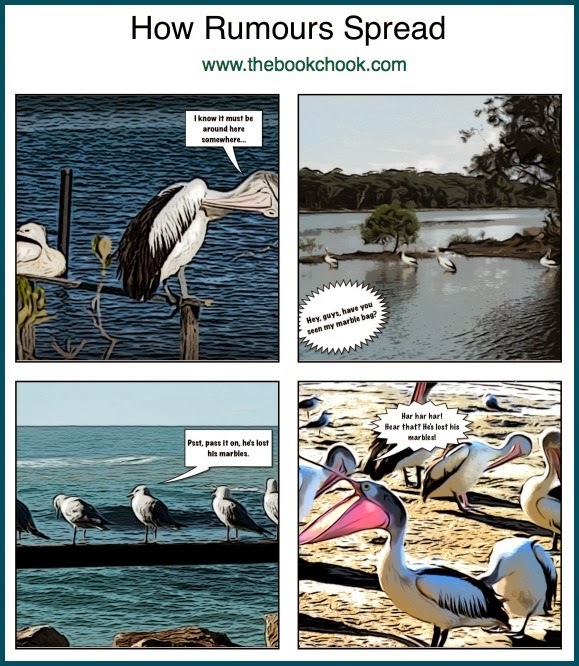 Teachers may prefer kids to storyboard first and then to produce illustrations and/or photos. Personally, I don't think it matters what comes first, as creating is often very organic and much more a spiral than a straight line. 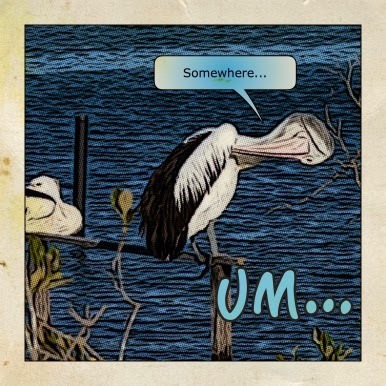 Once I had chosen my four photos, I used ToonPAINT-HD to change them slightly. You can see my original photo below, then below it, The Toonpainted version. 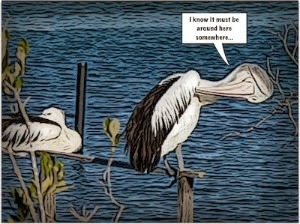 ToonPAINT-HD is one of the simplest and easiest apps I have used. Once you open it, you see a one screen tutorial that tells you everything you need to know to get started. 1. I loaded my photo from the camera roll 2. I adjusted ink lines but didn't need to really, as the app converted my pic immediately on loading. Still, it's fun to play with the settings to achieve the look you want. 3. I painted with colour. To do this, I took the easy way out and simply had the app paint it for me - click cartoon and the top left icon. But the potential is there for you to hand-paint. Kids will really have fun with that aspect I think, particularly the alpha brush that allows you to selectively reveal your image below. 4. I shared by saving to my camera roll, with other sharing options available. 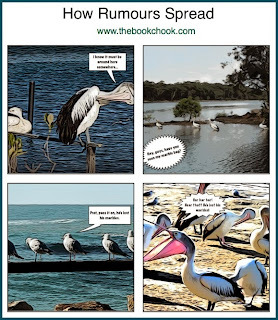 I used StripDesigner to add speech balloons to each photo. Then I used it to make a four frame template and add a photo to each frame. The result you can see at top. Potential: Children could make little booklets using this method. Children's work could be printed out and made into a paper book. Or they could stitch single images together into a slideshow using iMovie or PhotoPeach. They could use the camera built into their iPads to take photos of classmates, or of a process like seeds sprouting. They could also set up toys and models in scenes that lead to the telling of a story. There would be no need to use any image editors but ToonPaint is one they will enjoy for its effects. I also tried Halftone to compare the image "look", and you can see that version below. Yet another photo editor I like that gives suitable effects for a comic is Moku Hanga.